Hello PISO FARE friends! Want more affordable fares for your trips? Here are the Philippine Airlines domestic promo tickets for 2017 until 2018 in celebration of the Philippine Independence Day! The domestic PAL seat sale is divided into 2 travel periods: 1) July 1 until August 31, 2017 and 2) September 1 to December 10, 2017 and extended from January 16 to March 15, 2018. PAL promo fares 2017- 2018 are valid for one-way travel and covered government taxes, fees, ticketing service charge and surcharge. Domestic tickets include 7 kilos cabin baggage and 10 kilos checked baggage and in-flight snacks. Booking for the Philippine Airline seat sale starts June 8 and ends by June 15, 2017. 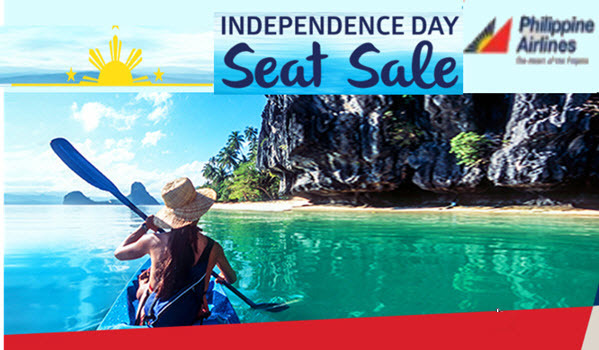 Sale flights have limited availability and may not be present on all flights! Philippine Airlines International Promo Fare for Independence Day. Book the Philippine Airlines promo fares online at www.philippineairlines.com or buy your tickets at PAL ticket offices, travel agencies and booking offices. You may also call the Philippine Airlines Reservation Numbers to reserve the low fares. Here are Philippine Airlines Reservation Numbers for your reference. Infant’s fare for infants below 2 years old without a seat is 10% of adult ticket rate. There is no child discount on this sale. Brace yourself for this amazing Philippine Airlines promo. Be ready to book as soon as booking starts on June 8, 2017! Or, buy your tickets at the nearest booking offices and travel agencies!